Many people remember America as the band who wanted to be CSN&Y, but their mustached melodies and harmonies treaded more fearlessly into the kind of soft rock explored by Bread. 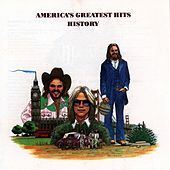 This compilation boasts hits like "Horse With No Name," "Ventura Highway," "Muskrat Love" (dig the Moog solo on this one), and the epic "Tin Man." 1972, 1973, 1974, 1975 Warner Bros. Records Inc.